If you have used a modern Linux system then you know how easy the task of burning CDs has become. I have covered the K3B tool as well as burning CDs from the command line. And although both methods have their merits, neither are as simple to use as the Brasero CD/DVD burner. Q: What is a "brasero"? A: A Spanish oven that is placed under a table in order to heat those sitting at the table. Correct, but not in terms of Linux. A 2.0: A GTK+ front end for cdrtools, growisofs, and (optionally) libburn. Most modern Linux distributions that use GTK+ (in other words, GNOME) ship with Brasero installed as the default burner. The reason is two-fold: It is simple to use, and it integrates seamlessly with Nautilus (the GNOME file manager). In this tutorial you will see how simple it is to use Brasero to create a new data CD, to copy a CD, and to burn a CD image. Supports both CD and DVD formats. Automatic filtering for unwanted files. Supports all audio formats that are included in gstreamer. Single session DVDs and any format of CD. Of course the best feature of all is that Brasero is simply as easy as it gets. 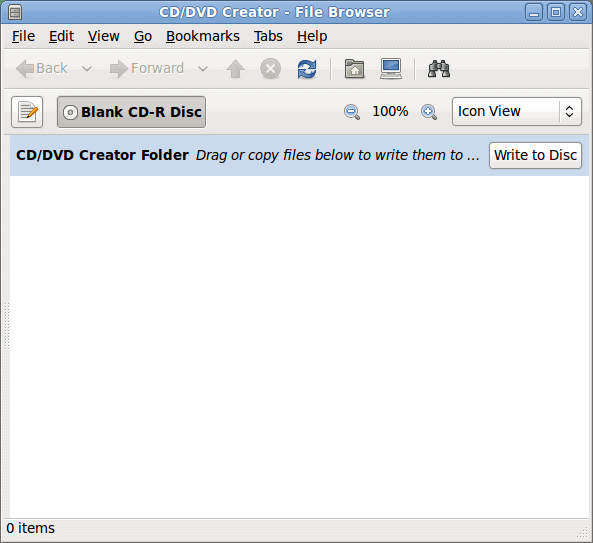 When you insert a blank CD or DVD Brasero will open up a window (see Figure 1) that allows you to select what action to take. The default action (though not configured to happen automatically) is to open Brasero. 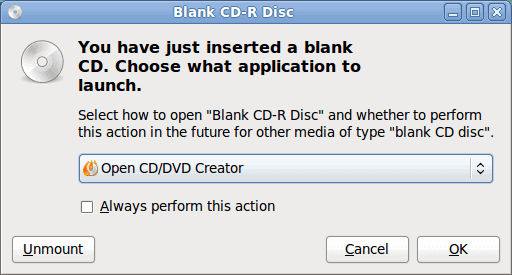 You can make sure this happens every time you insert a blank CD/DVD by clicking the Always perform this action checkbox before you click OK.
What can you do with that? Simple. Open up a Nautilus window and enter the burn address in the location bar. What happens? Nautilus automatically switches from standard file manager to Brasero burner, where you can drag folders/files for burning. There are two ways to drag and drop files. The first way is to open up a Nautilus window and drag your files from there into the Brasero window. The other way is to open up another tab in Brasero, navigate to the folder/files you want to burn, and drag them onto the burn tab. When you insert a writable media what opens is Nautilus in the burn address. If you open up the full blown Brasero, you will see a very different window (see Figure 3). As you can see this is where you can do the real work. From within this window you can create all of the various projects Brasero can handle. 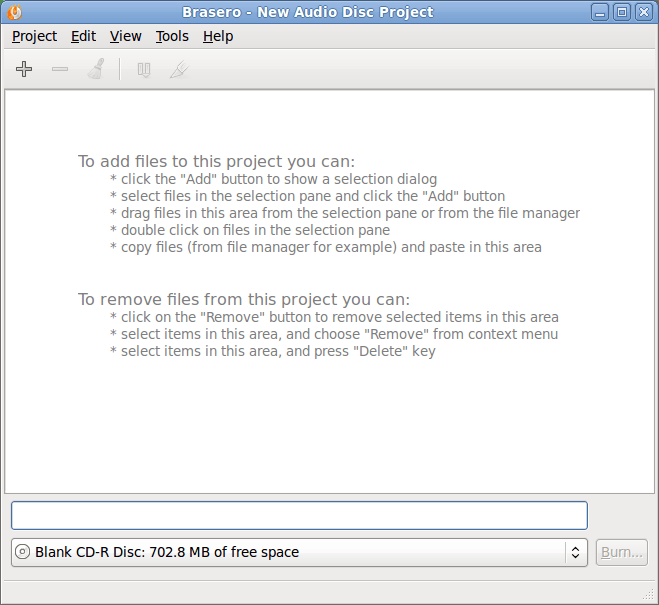 Say you want to create an audio project from within Brasero. Click on the Audio project button and the brasero window will change according to the project you have selected to create (see Figure 4). From within this new window you will see just how easy it is to add or remove files for this project. After you add the folders/files you simply have to select your media and click the Burn button. Brasero has brought to Linux one of the easiest methods for burning disks of any operating system. So if burning CDs/DVDs is something you have considered an obstacle keeping you from adopting Linux, consider that obstacle officially, and permanently, removed. Actually, I have always found cutting CDs on Linux to be easy. My first experience was of trying to do it on Windows with Nero – what a nightmare! Then k3b arrived and it was so-o simple to create CDs that can be read on virtually any other machine, whereas Nero would only cut CDs that can be read on Windows machine – useless. Easy? Yes. Reliable? No. Feature Rich? Not even close. If you actually want to burn USABLE Discs and not coasters 7 out of 10 times, then you want to use K3B, period. Brasero just doesnt even come close to K3B’s Feature list or Reliability. Normally I use k3b. Last year I used Brasero for one ocassion. The burnt CD did not open up. Today I thought to use it again to test its maturity over time. Again I am disappointed. Even after getting the message- “Audio CD successfully created”- the CD did not bother to mount. I followed every step cautiously though. So, again today Brasero left me to shame before an MS user, for whom I was burning the compilation of tracks. Nevertheless, for K3B the case is different. K3B outperforms not only Brasero but, I bet, any dedicated proprietary disk burning software till date. Pl. comment/help me on how to “get that burnt cd working”.